Hi. Yesterday we walked everywhere in Lima. For a while we where just walking around to check out Lima, Peru. After that we tried to find some restaurants that looked good for lunch, and we finally found some. Then we went to the Catacombs in a church after lunch. 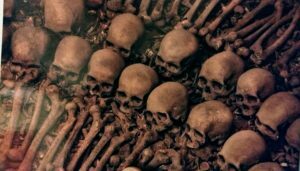 The Catacombs had a bunch of bones from real people. Most of the bones were arranged in all different kinds of arrangements. When we were done doing all of that we took a Taxi to a restaurant where we were meeting Iso’s Mom, Dad,her nieces (Alessia and Lara) , and Iso’s sister , which was Alessia and Lara’s mom. We all meet at a restaurant and ate dinner at 7:30. I ordered Carbonara pizza and ate some of Everett’s pesto. Then with Alessia Lara, Everett, and my Mom, we went to go check out some desserts that we wanted. We all saw this chocolate dome that was called a Chocolate Explosion. The Chocolate Explosion was a chocolate dome that had ice cream and a brownie inside. To melt the chocolate dome the waiter poured a chocolate syrup on top of it. Once we were done eating dessert Iso’s parents dove us to our house. By the time we got home, it was time to go to bed.